Ahoy, me Hearties! September 19th is International Talk Like A Pirate Day. In honor of this bloody great day I thought I would let ye landlubbers all in on how ye too can search like the pirates do. An I no just talk’n bout the 7 seas mind ye! You will first have to drop anchor at Google.com. Once you get there you will have to spy the Language Tools link. Then once you land on the Language Tools page you will need to spot the Pirate link and click on it. Congratulations! You can now Search Like a Pirate! 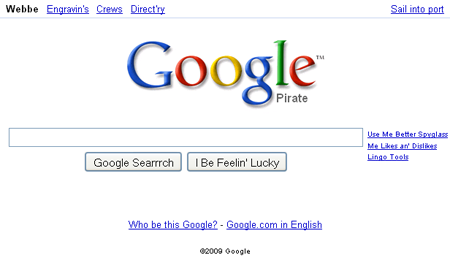 Google Search Like a Pirate! Visit the official International Talk Like A Pirate Day website to learn more about how you can enjoy this day! The Pirate Treasure also has a large booty of Pirate Phrases that is sure to impress even the hardest of Seadogs. 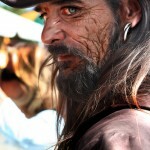 Pirate photo courtesy of mydearDelilah (link no longer works https://www.flickr.com/photos/mydeardelilah/) on Flickr.